It doesn’t matter if you’re talking movies, music. or even live theater; there’s some strange and spooky things going on out there! Here’s just a sampling of some of the odd entertainment industry-related objects I’ve accumulated over the years. Reaching their heyday in the 1950s and 60s, Spook Shows were a bizarre combination of stage and screen. Usually held inside an old theater (and almost always beginning at the stroke of midnight), Spook Shows would consist of everything from showing horror movies to one-act plays and would usually have masked actors jumping out and scaring the audience. Most of the time, the upcoming Spook Show would be teased in local papers with such lines as “the most frightening thing you will ever experience” or “not for the faint of heart.” Gimmicks such as “Fright Insurance” were often employed to really work the incoming crowd up into thinking they were really going to see something scary. 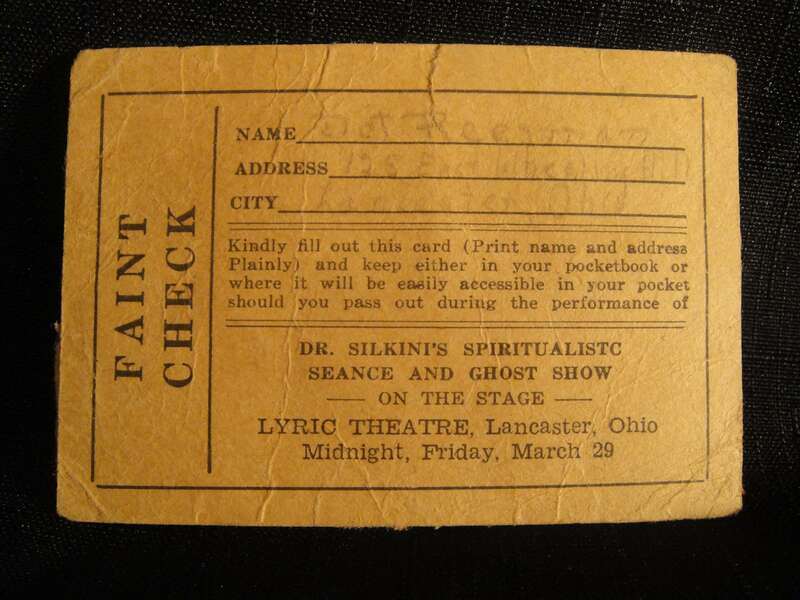 The above “Faint Check” was handed out to all people in attendance of the Friday, March 29th performance of Dr. Silkini’s Spiritualistic Seance and Ghost Show at the Lyric Theatre in Lancaster, Ohio. 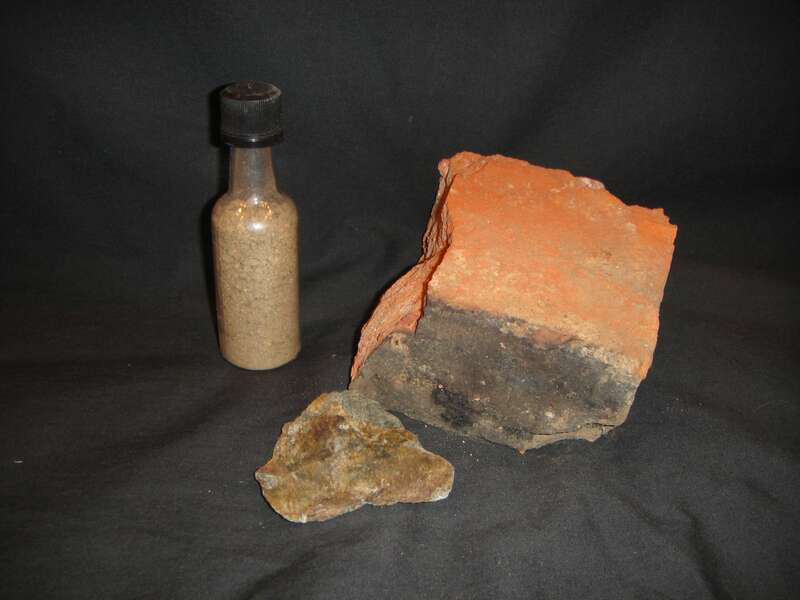 Set consists of a charred brick from the fireplace of Rustin Parr‘s home (the house at the end of the movie), dirt from the basement of Rustin Parr’s home (where the movie’s final scene was filmed), and a rock from Coffin Rock. 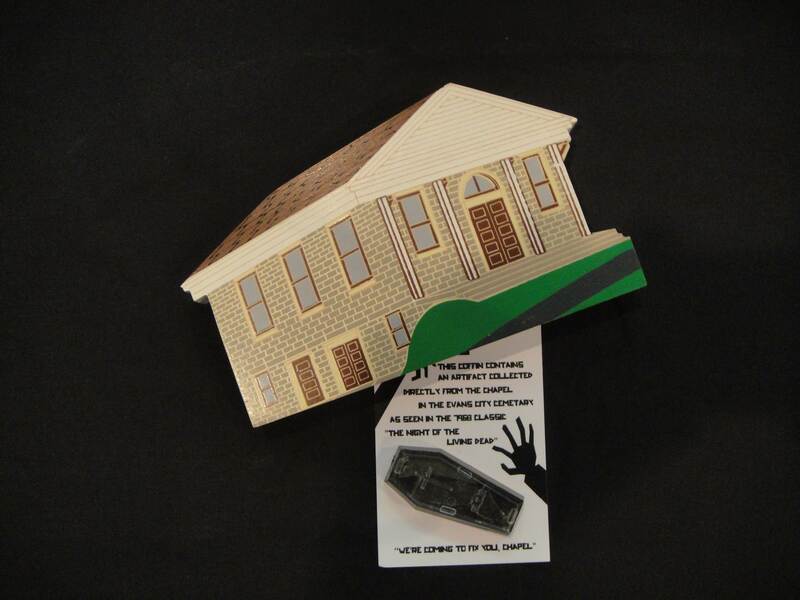 Materials related to the chapel inside Evans City Cemetery, which was featured in the opening scenes of George Romero’s Night Of The Living Dead in 1968. The chapel is located in Evans City, Pennsylvania and is the only building from the movie that’s still standing. 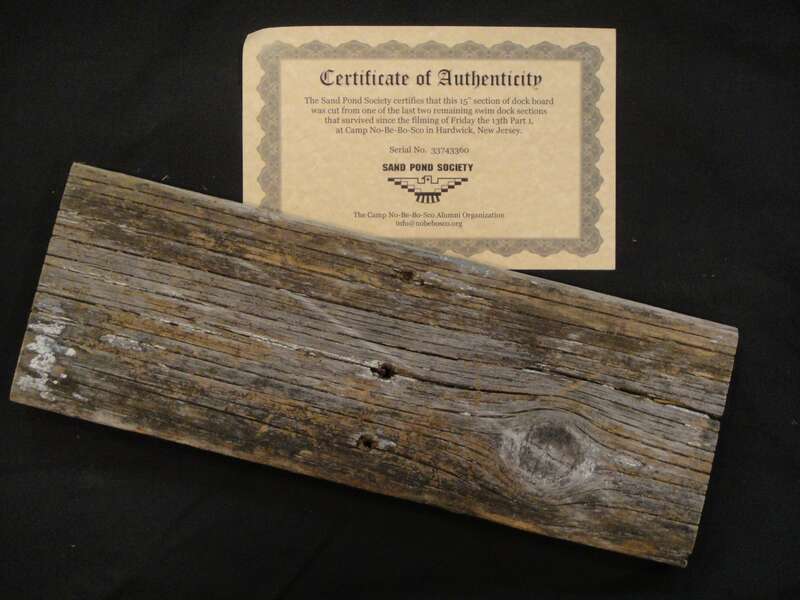 Wooden replica (top) was created in February of 2012 local artist David H. Kennedy. Tiny plastic coffin (bottom) contains authentic “artifacts” removed from the chapel during renovations. Section of dock #1, which was featured in the original Friday The 13th (1980), which was filmed in New Jersey with Camp No-Be-Bo-Sco standing in for the infamous (and fictitious) Camp Crystal Lake. 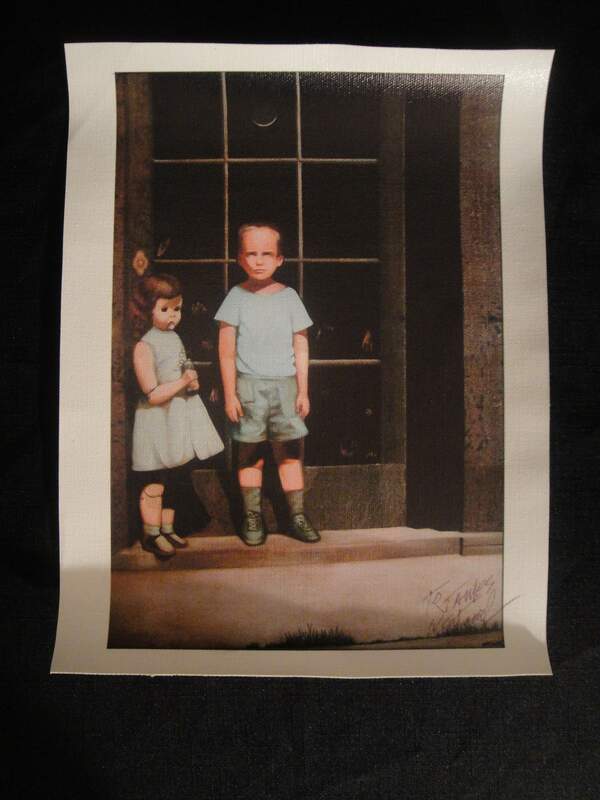 While the painting’s official title is “The Hands Resist Him”, it will forever be known as the Haunted eBay Painting. Artist William Stoneham, who created the piece, has no idea how the painting came to be known as haunted (or to end up on eBay, for that matter). The above is an 8×10 print of the piece, signed (and personalized) by Stoneham. Original watercolor and acrylic painting by Henry Hill, the infamous gangster made famous in Martin Scorsese’s 1990 epic, Goodfellas. 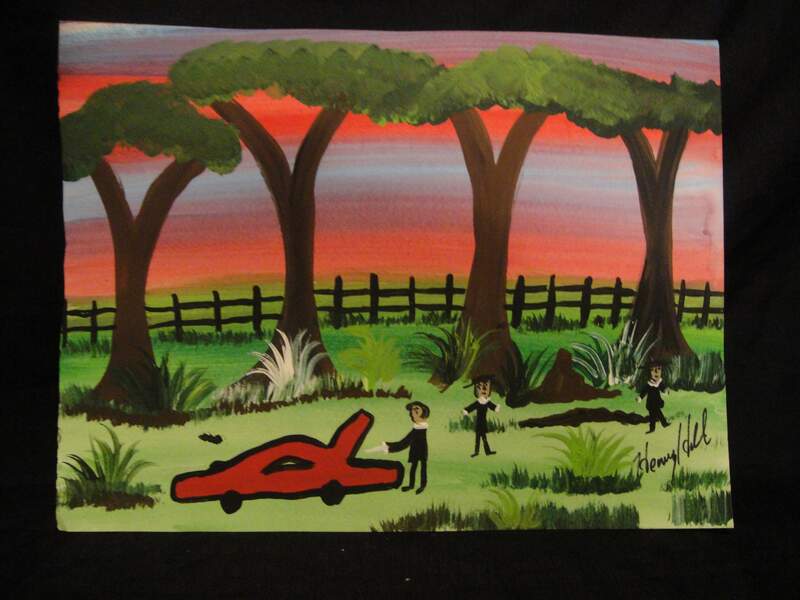 Perhaps most disturbing of all is that the subject of Hill’s painting is the murder of Billy Batts, which is featured in the opening scene of Goodfellas and revisited again halfway through the film (WARNING: video contains language and graphic violence).